La Maison published ads on heat and sound insulation by Isoverbel and Lenders. 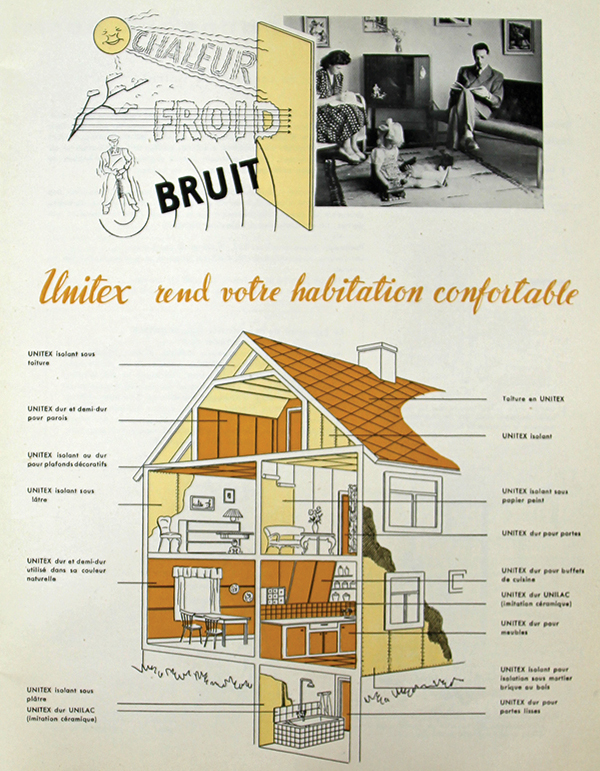 The first publication on a post-war house in Brussels in which insulation was used appeared in La Maison. Insulation against heat and sound transfer became a popular theme in the specialized architectural and technical literature in Belgium. Synthetic insulation materials revolutionized the insulation market. The German company BASF developed Styropor, an expanded polystyrene foam. It was put on the market in 1954. La Maison published two series of articles by Antoine de Grave on insulation. Following the success of Dow and BASF, Eternit and Isoverbel extended their product range from mineral insulation to synthetic insulation in the late 1950s..
Bouwen en Wonen published an article on the thermal insulation of houses as an important source of cost reductions. The λlambda-value of materials started to appear in Belgian periodicals. Styropor was applied on a very wide scale, with tens of millions of square meter of Styropor applied in 1960. The Association for Thermal and Acoustical Insulation was founded. The BBRI published several technical reports on insulation during the 1960s, for instance on the insulation of flat roofs in 1962. The first Belgian factory for Foamglas was established in Tessenderlo. A special committee of the BIN prepared the first Belgian norm on insulation. Energy prices rose due to a global oil trading conflict in the early 1970s. The Club of Rome’s presented Limits to Growth, raising public awareness of the finite supply of natural resources. The General specifications for private buildings devoted 25 pages to thermal insulation. The first Belgian norm on thermal insulation (NBN B62-001) was issued. 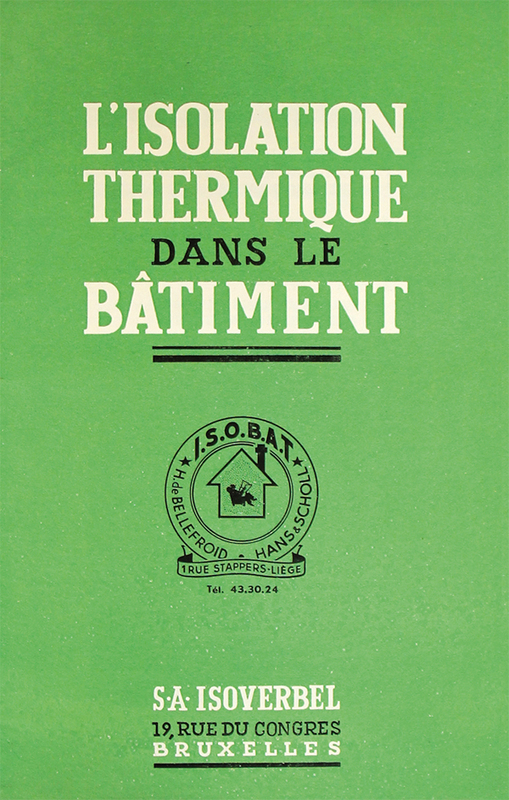 In 1945, in the very first volume of La Maison, two companies promoted the use of insulation materials they manufactured: Isoverbel and Etablissements Ernest Lenders. 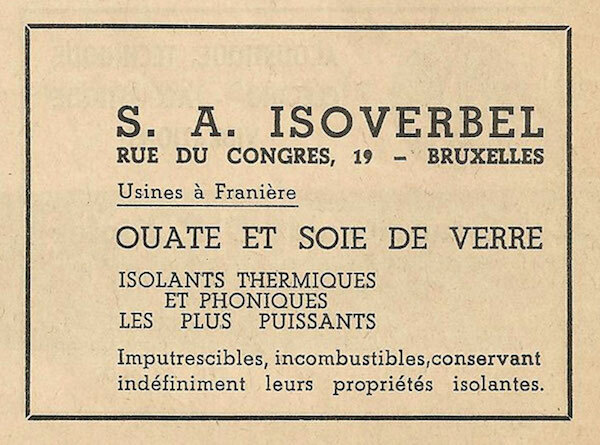 Remarkably, at this early date, Isoverbel and Etablissements Ernest Lenders sold products for heat insulation as well as for sound insulation. Although heat and sound transfer through diverse means and according to different rules, thermal and acoustical insulation indeed were often dealt with together. They were often manufactured from the same raw materials (vegetal, mineral, or synthetic). 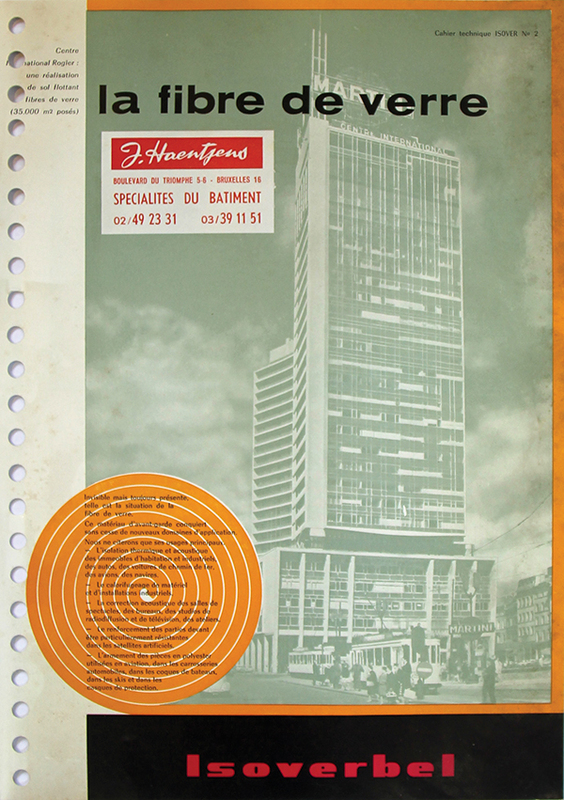 Insulation, against both heat and sound transfer, became a popular theme in the specialized architectural and technical literature in Belgium in the early 1950s. In the late 1950s and the early 1960s, consulting agencies arose to conduct full thermal studies, which helped increase the use of thermal insulation in everyday building practice. At the same time that architectural trends resulted in ever lighter and less inert structures, there was a growing awareness of heat losses and associated problems such as waste of fuel; oversized heating installations; and high heating expenses. In 1974, at the end of ‘les trentes glorieuses’ and just after the first Oil Crisis, the first Belgian norm to regulate the use of thermal insulation was issued. Some post-war building materials, with diverse properties, received the label ‘thermal insulating’ rather quickly. In fact, it was not until 1990, when a European standard was issued (ISO 9774), that an internationally accepted maximum λ-value of 0.065 W/mK for thermal insulation materials was agreed upon. The different types of insulation materials and products can be classified in various ways, for instance, by their structure (e.g. fibres, granules, or cellular), by their form (e.g. panels, sprays, blankets), or, most commonly, by their physical nature. The latter characteristic distinguishes among vegetal, mineral, or synthetic insulation materials. The most popular vegetal insulation material was wood (whether or not mixed with cement or other products), and after this, cork and flax. The most commonly used mineral insulation materials were glass fibres, rock wool, asbestos, cellular glass, and expanded perlite and vermiculite. Synthetic insulation materials, such as expanded polystyrene (PS) and polyurethane foam (PUR), revolutionized the insulation market after they appeared in the 1950s. As an insulation material, wood was mostly used to create different types of fibreboards. Vegetal fibres were first used to make construction boards at the beginning of the 20th century in America, after which wood and other vegetal fibres began to be used intensively in construction materials throughout the world. Most of these boards and panels were available in large dimensions, and between 10 and 30 mm thick. But plain wood-fibre panels had drawbacks: they were sensitive to heat and to moisture; they bent and expanded; and they roted and reacted to chemical agents; and thereby lost their original aspects. To overcome these difficulties, especially the sensitivity of wood fibres to heat, moisture, and chemical agents, two strategies were very popular: either treating the surface of the panel, for instance with a decorative finish or wood veneer, or mixing wood fibres with cement or resins to ‘stabilize’ its characteristics. Such wood-fibre cement boards were a bit heavier than the plain wood-fibre boards; they typically weighed between 300 to 600 kg/m³ instead of 220 to 250 kg/m3. The wood-fibre cement panels were fire resistant, and their λ-value varied between 0.08 and 0.15 W/mK. They were often used as permanent moulds for in situ concrete walls or floors. Another type of wood panel was produced with small, calibrated wood particles and (synthetic) resins that were based, for example, on melamine or urea-formaldehyde. The mixture was formed into panels by pressing it between two plates or by extrusion. The applied pressure resulted in a higher volumetric mass of approximately 650 kg/m³. Depending on the type and brand of panel, an external coating or finishing was applied to enhance the decorative aspect and/or make it impermeable to water and air. These panels were more stable than ordinary wood-fibre panels, but their resistance to moisture and fire was still not ideal. Wood-fibre and wood-particle panels could be sawn, drilled, and nailed like natural wood products. Although wood-fibre panels possessed the low thermal conductivity of wood (thermal conductivity or λ-value commonly between 0.1 and 0.5 W/mK), the insulating properties thereof were often secondary: most of these panels were used for their decorative aspects and self-supporting qualities in finishes, screens, or partition walls, or as a permanent mould for in situ concrete, rather than principally for their insulating capacities. Cork also was relatively popular for insulating against heat, cold, sound, and vibrations. Natural cork is light, compressible, elastic, impermeable to water and gas, rot-proof, and fire resistant. Its insulating characteristics are due to the fact that cork encloses numerous air bubbles within its cellular structure. Yet, as it is rather heterogeneous, it is difficult to use in its natural state on a wide scale. Therefore, agglomerated cork, a manufactured product, was developed: cork granules were put under pressure in an autoclave, where they expanded and agglomerated at high temperatures. Agglomerated cork was produced in the form of boards, tiles, blocks, etc., and was applied in floors (under carpets, parquet, or tiles), roofs, walls, around tubes, etc. The λ-value of cork varied between 0.038 and 0.40 W/mK. Unlike most vegetal materials, mineral insulation materials typically were fire resistant, non-hygroscopic, and rot-proof. These three characteristics made them well suited for insulation, especially to fill cavities and other places that were difficult to inspect. An even more important quality was their low λ-value, which was generally smaller than 0.05 W/mK. Glass fibres were a very popular mineral insulation material, which came in the form of sheets, (semi-) rigid boards, and blankets. Glass fibres products commonly weighed between 20 and 300 kg/m³ and had a thermal conductivity of 0.031 to 0.050 W/mK. They were fire resistant, non-hygroscopic, and elastic. A particular type of glass insulation, based on molten glass instead of glass fibres, was cellular glass, made exclusively by Foamglas. The molten glass was expanded so that it increased to 15 times its original volume. Thanks to the thousands of small cavities inside – which did not communicate with each other – cellular glass insulation was impervious to water, damp, acid, and lye. Its thermal conductivity was approximately 0.050 W/mK. The material was light (144 kg/m³) and fireproof. Also, it was rot-proof: being inorganic and having zero capillarity, it was not affected by fungi. As it was always dry, it retained its original qualities, and it did not weather. 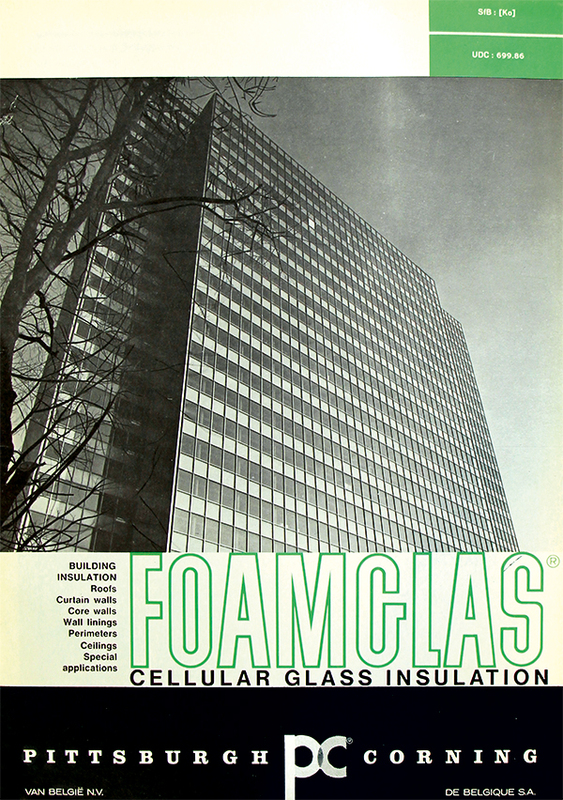 One of the special characteristics of cellular glass insulation was its high compression resistance and ability to retain its form: it resisted up to 70 N/mm² and more in compression; its resistance to bending equalled 51.5 N/mm²; and its thermal expansion coefficient was only 9 x 10-6/° C. Foamglas was produced in hard blocks. These were approximately 45 cm wide and 30.5 cm or 61 cm long, and came in various thicknesses, from approximately 2 cm up to 13 cm. The blocks were easy to transport, cut, and handle. They would be applied to flat roofs and parking decks (directly on concrete slabs or on roof sheathings, in combination with the common bitumen systems) and to sloping roofs. It was used in wall constructions, inside a cavity wall or as wall linings (as insulation, as protection, and as a self-supporting structure enhancing the wall’s fire-resistance). It was also used as the inner core of a curtain wall. Because of its high resistance to bending, it was used beneath floors and hollow core slabs, in foundations, and under window sills. Rock wool had roughly the same physical properties as glass fibres. Its weight varied between approximately 20 and 300 kg/m³ and it had a λ-value of 0.040 W/mK. Rock wool was produced by the Johns Manville Corporation among others. Once very popular for insulation but now no longer used, asbestos is a natural mineral fibre obtained by grinding a crystallized volcanic, silicate rock. During the post-war period, asbestos was praised for its physical properties: good sound dampening, low thermal conductivity of 0.040 to 0.045 W/mK, fire resistant, high tensile strength, rot-proof, and low cost. Yet the general acceptance of the health risks related to working with asbestos led to a ban of asbestos in Belgium in 2001. Asbestos was formed into prefabricated elements (panels, pipes, roofing tiles, etc.) and also included in sprays to be applied in situ. The weight varied between 10 and 200 kg/m³; sprayed asbestos was applied in layers of 100 to 300 kg/m². Perlite is an amorphous aggregate of volcanic glass with a relatively high water content. In the factory, the aggregate was crushed and put into an oven: the water vaporised, causing an important expansion (12 to 20 times its initial volume) and creating closed cells. It was very light, fire resistant, resistant to acid, chemically inert, rot-proof, non-hygroscopic, and resistant to very high and very low temperatures. Expanded perlite was used for thermal and acoustical insulation; to fill voids and cavities (with small, medium, or large calibres); and as an additive in concrete, mortars, screeds, and plasters to enhance thermal capacity. Expanded perlite weighed between 60 and 120 kg/m³. In Belgium, expanded perlite was produced by Slaets & Co and by Eternit under the brand name Lithoperl, manufactured by its Pierrite division. Both companies promoted perlite as an aggregate for insulating concrete and insulating renders. The insulating capacity of a mortar mixed with Eternit’s Lithoperl was two to three times better than pumice concrete and seven to eight times better than stone. Acoustically, a layer of Lithoperl mortar on hollow core slabs or bricks absorbed 30% of the air and contact sounds, which was comparable to the efficiency of contemporary floating floors. Lithoperl concrete weighed between 435 and 625 kg/m³; the λ-value was between 0.070 and 0.122 W/mK; and its compressive resistance varied between 78 and 265 N/mm². Slaets offered three types of ‘béton peralite’: regular concrete (one part cement to three parts of perlite); concrete for insulating screed (1/5); and concrete for flat roofs (1/7). For each of these three types, weighing approximately 600, 450 and 390 kg/m³ respectively, the thermal conductivity was 0.22, 0.11 and 0.092 W/mK and the compressive strength was 490, 294 and 118 N/mm². For renderings, Slaets recommended applying at least two layers of approximately 7 mm, composed of one part cement or plaster to four parts of perlite. Vermiculite is a silicate mineral or mica (with aluminium and magnesium elements), which is similar to perlite. When it was treated at high temperatures, it expanded to 15 or 20 times its initial volume, weighing approximately 100 kg/m³. In addition to its high insulating capacity, expanded vermiculite was fireproof, insensible to acid, and non-hygroscopic. Like perlite, it could be used both in bulk and in combination with a binding agent (concrete, cement, chalk). Slaets & Co promoted ‘béton vermiculite’, containing one part cement and 3 to 13 parts vermiculite. The exact properties depended on the mixture; it commonly weighed between 300 and 600 kg/m³ and had a thermal conductivity of between 0.116 and 0.81 W/mK. Mixed with plaster, expanded vermiculite could also be used for insulating coatings or stucco. Or, as a substitute for cork, expanded vermiculite could be used in nailable screeds – although Slaets & Co. specified that for such applications, perlite was a lighter, less hygroscopic, and therefore a better option. Compared to vegetal and mineral products, synthetic insulation products are relatively young. Many vegetal and mineral materials were used already before the Second World War: asbestos was already used during the Industrial Revolution, mineral wool insulation was commercialized in the 19th century, and in the 1930s, the European market for wood fibre board flourished. Not until shortly before and after the Second World War did synthetic insulation materials emerge, and they quickly gained acceptance. They originated in developments in the modern chemical and petroleum industries, mainly in Germany, the U.S.A., and the U.K., which brought forth an ever-increasing number of plastics. In 1946, 50,000 tons of plastics and synthetic materials were produced worldwide, a quantity that rapidly increased to 1,000,000 tons in 1960. The two most important synthetic insulation products were expanded polystyrene (PS) and polyurethane foam (PUR). Other products include polyvinyl chloride (PVC), polycarbodiimide foam, polyisocyanurate (PIR), phenol formaldehyde (PF, e.g. Bakelite), urea-formaldehyde, and polyester foam. Common to all these products was a very low volumetric mass (usually less than 40 kg/m³) and a low λ-value (between 0.027 and 0.044 W/mK). In addition, they were generally inert, and resistant to chemical and biological substances. They were highly flammable. Usually they were covered or used in cavities. Nevertheless the ‘appearance’ of plastic foams caused a revolution in the insulation market during the 1950s. Polystyrene, a product derived from benzene, had been used in construction since 1930, but it was not until 1951 that a way to expand this product was developed in Germany, by the Badische Anilin- & Soda-Fabrik (BASF). Thereafter, the French company Saint-Gobain and the American Dow Chemical Company developed new ways to process expanded polystyrene, leading to similar products, each with a specific trademark. Expanded polystyrene was manufactured as a white, cellular foam. It was inert and did not absorb or react to water, cement, plaster, or bitumen, for example, but certain types of oils and solvents made the material unstable. It was placed in cavities or behind fire-resistant materials, because of its highly flammable nature. Polyurethane foam, the second main type of synthetic insulation, was developed in Germany in 1937. It was manufactured as soft, semi-soft, and rigid foam, and was used mainly in furniture, the automobile industry, and construction, respectively. The rigid foam, with a closed cellular structure, weighed between 25 and 150 kg/m³ and had a λ-value of 0.029 W/mK. It resisted chemicals and biological substances, but did absorb water. Polyurethane foam was produced in prefabricated blocks and plates (between 2 and 6 cm thick), but could also be projected or injected on site. Like expanded polystyrene, polyurethane foam was highly flammable. The plates were therefore covered with sheets of, for example, kraft paper, bitumen, plaster board, or aluminium foil, or placed inside a cavity wall. Other main applications were as insulation in flat roofs, beneath the waterproofing, and (because of its resistance to compression) as floor insulation, beneath wooden joists or on top of the joists, under a cement covering layer. The dimensions for commonly used polyurethane-plaster panels were 1.20 m wide; 3, 4, 5, or 6 cm thick (with 1 cm extra for the plaster board); 2.50, 2.60, 2.80, and 3.00 m high. These panels could be glued or mechanically fixed to the walls. Given the diverse kinds and forms of insulation, many brands were available in the Belgian market. A number of these were Belgian (produced in Belgium by a Belgian company), while others were imported by large international companies, or produced in Belgium by local divisions of big multinationals. The synthetic insulation materials, in particular, were produced by international companies. Sparked by the introduction of synthetics, a number of Belgian companies that already produced mineral and vegetal insulation materials expanded their activities. One of the main Belgian insulation companies was Isoverbel. Short for Isolation de verre belge, Isoverbel produced thermal and acoustical insulation materials made from glass (glass wool, glass silk, and glass fibres). It formed in 1937 from the insulation department of the glass company Saint-Gobain. Isoverbel had a large research and consultancy department, and a production department with two factories in Franière and Namur. Their insulation products were rot-proof, fire resistant, and unaffected by moisture and micro-organisms, and they retained their insulating properties permanently. Glass fibre products existed in various forms: in bulk; sewn on cardboard mats or galvanised wire mesh; as sheets and blankets, possibly with bitumen paper covers; rigid plates and perforated panels; mixed in a finishing mortar, etc. The basic panel produced by Isoverbel, designed to insulate inner and outer walls and cavity walls, was Isover P.B., a semi-rigid glass fibre panel measuring 60 by 120 cm. By incorporating such a panel in a cavity wall, the thermal resistance of the wall would quadruple. These panels could be finished with a bituminous kraft paper on one side, which functioned as a vapour barrier. Another Isoverbel product was Rollisol: this was a blanket on a continuous roll, up to 12 m long, with a bituminous kraft paper on one side and a perforated kraft paper on the other side. It was used to insulate roofs. Thin sheets IBR were also sold on continuous rolls, with the option of bituminous kraft paper coverings. Roof panels called P.I. Roofing were very heavy and rigid with a layer of glass fibre-reinforced bitumen on top. Another type of rigid panel was Shedisol Alu plates: these had kraft paper or a layer of aluminium foil on one side, and were used in cellar floors or roofs of industrial buildings. Isoverbel’s product range was further expanded with panels P.I. 156, P.I. 256, P.I. 456, acoustic panels P.A. 305 and Bergla, Stryroverbel (expanded polystyrene), etc. As they had a large range of products, which were used in a very broad range of applications, Isoverbel developed many manuals and other kinds of documentation for their thermal and acoustical insulation products. For instance, they prepared a number of building specifications, each time indicating the appropriate product for a particular application, e.g. for the insulation of concrete floors with floating floor systems (Feutre-sol Isover), flat roofs (P.I. Roofing), external walls and cavity walls (Isover P.B. panels), and pitched roofs (Rollisol). Isoverbel’s products were also sold by Cantillana, a building materials supplier founded in 1875 in Sint-Niklaas, which specialized in plaster and gypsum. 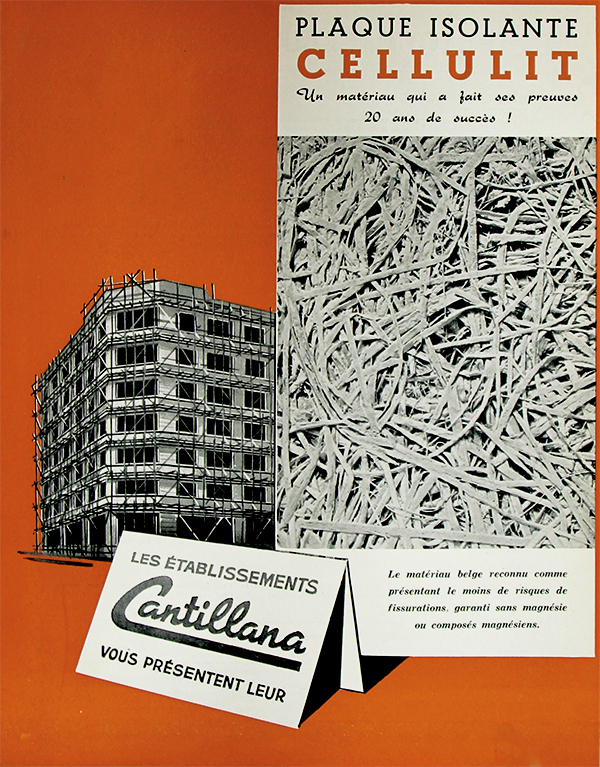 Since 1933, Cantillana sold their own Cellulit board – panels made with wood fibres and gypsum, which were lightweight, insulating, and fire resistant. In addition, from the early 1950s onwards, Cantillana sold glass fibre products, including those made by Isoverbel; they claimed to be the “seul agent dépositaire pour le Grand-Bruxelles de la S.A. Isoverbel”. Their product range consisted mainly of glass wool (in bulk or blankets, whether stitched or not onto cardboard, kraft paper, or a galvanized trellis) and glass silk (in sheets and rolls). These could be used between a concrete floor and screed, and in lowered ceilings, walls, and flat and pitched roofs. Cantillana also created some added value by incorporating the standard Isover P.B. panel in an acoustic panel called Insona. These perforated finishing panels were made out of plaster with glass fibre reinforcement and measured from 30 by 30 cm to 62.5 by 62.5 cm, and up to 2 cm thick. To enhance the sound absorption, they were finished with a veil of glass silk Coromat and a semi-rigid Isover panel at least 2.5 cm thick. The Insona panels were fire resistant, form-retaining, and insensible to moisture and high temperature. The panels were attached by means of screws, either onto a lattice structure or onto a suspended ceiling structure. 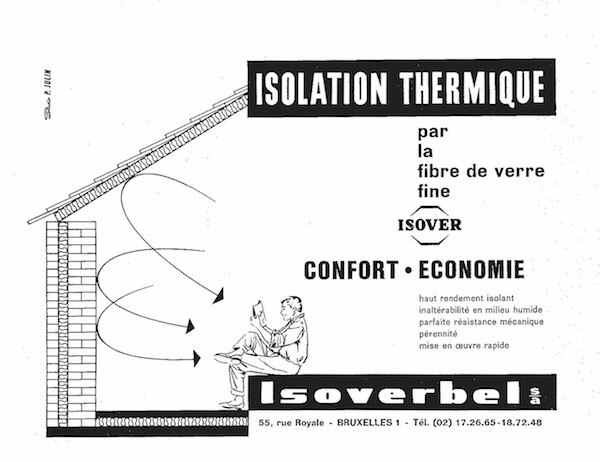 The firm Société Belge Isolex was very similar to Isoverbel: it was also a consulting agency, as well as producer and installer of glass fibre insulation. The company produced both thermal and acoustical insulation, with a focus on the latter (sound absorption, vibration dampers, and reverberation reduction). It produced insulation in different forms, e.g. panels, plates, tiles, and spray-ons. Examples of Isolex products are Fiberglas Aerocor (blankets with bakelized glass fibres, insensible to water and fireproof), Navitex (a sound absorbing, porous fibreboard), Acoustifibre (wood fibreboard), Econacoustic (light wood fibreboard), Fiberglas Perforated Tile, Travacoustic (mineral fibreboards), Gold Bond Insulation Tiles & Planks (wood fibre tiles), Metal-Acoustic (perforated panels), Acousti-pan (flat perforated metal panels with a core of glass insulation), and Sprayed Limpet Asbestos S.L.A. Except for the latter, an asbestos spray, most of these products were based on wood fibres or glass fibres, in the form of boards or tiles. The tiles and boards were often finished with a porous or rough surface to improve sound absorption. Isolex marketed insulating cement mortars for use as screed (e.g. Matelas R.B.) or as ceiling finish. It also produced Isostyrene: white, hard panels of expanded polystyrene, weighing between 15 and 60 kg/m³ (λ = 0.031 W/mK). These could be nailed, sawn, and painted; they were insensible to acid and oil; and they were flammable. In addition, Isolex distributed the glass fibre sheets and panels made by the American company Owens-Corning Fiberglas to the Belgian market, from the 1960s onwards. These plates absorbed sounds (because of the millions of enclosed air bubbles). They were light; easy to transport and to place; rot-proof; inert and odourless; fire resistant; form-retaining; and finished in various, decorative ways (striped, perforated, textured). The Owens-Corning Fiberglas products, which can be recognized by their pink colour, were also distributed in Belgium by Eternit, another Belgian company that produced and distributed insulation products. Eternit is known best for its asbestos products, which were used for insulation among other things (often mixed with cement or used in sandwich panels), yet Eternit actually had a broad range of (mainly mineral) insulation products. For instance, Eternit produced Eterglass, made with glass fibre wool that was ‘bakelized’ or impregnated with synthetic polymerized resins. Eterglass was fireproof, rot-proof, insensible to moisture, and available in different forms. These included Eterglass BL Kraft/Nu (sheets or blankets, with or without bituminous kraft paper), Rolliglas (with kraft paper on both sides), Sonosol (sound insulation blankets and boards), Type 700/701/702 (rigid and semi-rigid panels for walls), and Type 703/704 (rigid panels with a high density, mostly used in floors). In addition, during the 1960s, Eternit distributed a number of insulation products based on glass fibres manufactured by Owens-Corning Fiberglas, designed to insulate inner and outer walls, roofs, ceilings, and partition walls. All products, whether soft or rigid, incorporated glass fibres in different forms and qualities, e.g. sheets of polymerized spun glass fibres and glass fibre panels for false ceilings. The Owens-Corning Fiberglas ceiling panels (Sonocor, Sonoplat, and Sonoflex) were very similar to each other: they were put in place between metallic frames and were easy to lift or move afterwards, so pipes and ducts stayed accessible. The panels were low-maintenance, lightweight (0.85 kg/m²), and easy to clean with water and soap. As for thermal capacity, such a false ceiling would be equal to 25 cm of gas concrete or 108 cm of reinforced concrete. Acoustically, the panels performed very well, thanks to the air bubbles included in the mass of the glass fibre panels. Eternit also produced other insulation products like Menuiserite (a panel in asbestos cement with cellulose fibers), Lithoperl (expanded perlite), Eterfoam (an insulation foam based on an expanded phenol-formalin resin), and Glasal sandwich plates (with a core of polystyrene or Eterfoam). With this latter, Eternit extended their product range from mineral insulation materials to synthetic insulation materials. Isoverbel had done likewise, when the company started to produce the expanded polystyrene product Stryroverbel, following the success of the international manufacturers Dow and BASF at the end of the 1950s. The development of synthetic insulation materials caused a revolution in the insulation market, and not only because of the new types of products introduced or how they were applied. Because the production of synthetic insulation materials was dominated by big international companies, Belgium’s markets were opened to these foreign products. BASF and Dow were the two main global players. In 1951, the German manufacturer Badische Anilin- & Soda-Fabrik (BASF) developed Styropor – an expanded polystyrene foam. It was thermoplastic, so it softened and could be deformed when heated. Put on the market in approximately 1954, Styropor had almost immediate success and was applied on a very wide scale by the end of the 1950s, with tens of millions of square meter of Styropor applied in 1960. Physically, Styropor was 97 to 98.5% air in the form of million bubbles that did not communicate with each other. This structure made it ideal for both thermal and acoustical insulation. The thermal conductivity of Styropor corresponded to approximately 0.030 W/mK. Styropor was made in various densities, types, and forms. The weight classes varied between 15 to 20 kg/m³, 20 to 25 kg/m³, and 25 to 30 kg/m³. Four types of Styropor were developed by BASF (P, H, F and K): in addition to a different density, compressive strength, water absorption, and diffusivity, each type possessed specific properties like oil-proof, fire-resistant or a characteristic surface texture. Styropor foam was sold in various forms – from blocks and panels, to profiles and carpets. Styropor could be easily cut, sawn, drilled, nailed, and glued, making its installation quick and simple. Styropor absorbed almost no water because of its internal cellular structure with closed cells. Additionally, Styropor did not shrink or rot, and absorbed vibrations. 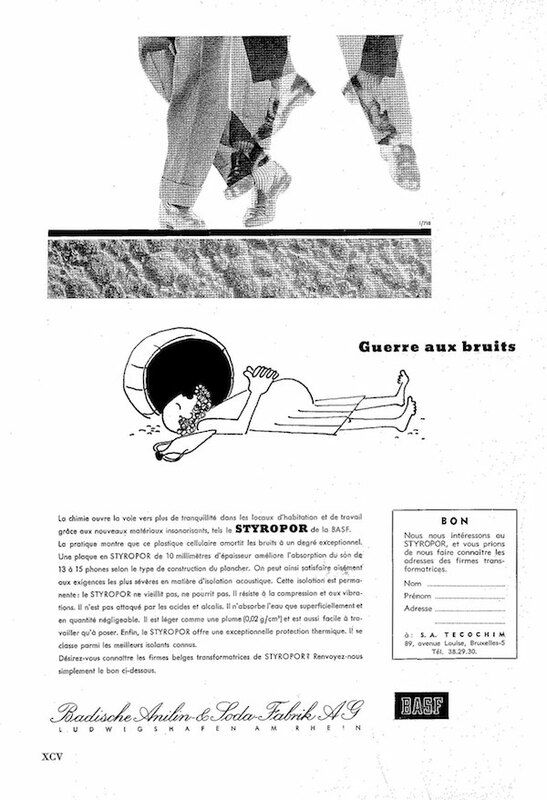 It was very resistant to compression and bending: immediately after installation in a floor, Styropor could be walked upon with light footwear. It was not damaged by seawater, acid, lye, or soda. Styropor also performed very well in ageing tests: tests involving six-year-old samples in 1960 showed that the structure and mechanical properties had not changed. Styropor was used to insulate inner and outer walls, floors, ceilings, pipes, foundations, terraces, and chimneys, and as permanent moulds for in situ concrete. It was also used as acoustical insulation for walls and ceilings; as floor tiles, to absorb contact sounds; and in floating concrete floors. The Dow Chemical Company USA, founded in 1897, was one of the world’s largest chemical companies in the post-war period. Dow produced two important insulation products, both made of extruded polystyrene: Styrofoam FR (which is still being produced in 2015 and marketed for its “exceptional long-term insulation performance on foundations, walls, roofs and more”) and Roofmate. Styrofoam was an expanded, rigid polystyrene foam and, unlike Styropor, was made by extrusion. Its properties otherwise were quite similar to those of Styropor. Styrofoam had a closed cellular structure, so it was waterproof. Styrofoam was easy to cut, kept its insulating capacity, and did not deteriorate or weather. It was also lightweight, impermeable, and fireproof. It possessed a high rigidity and excellent mechanical properties in compression, bending, as well as shear. 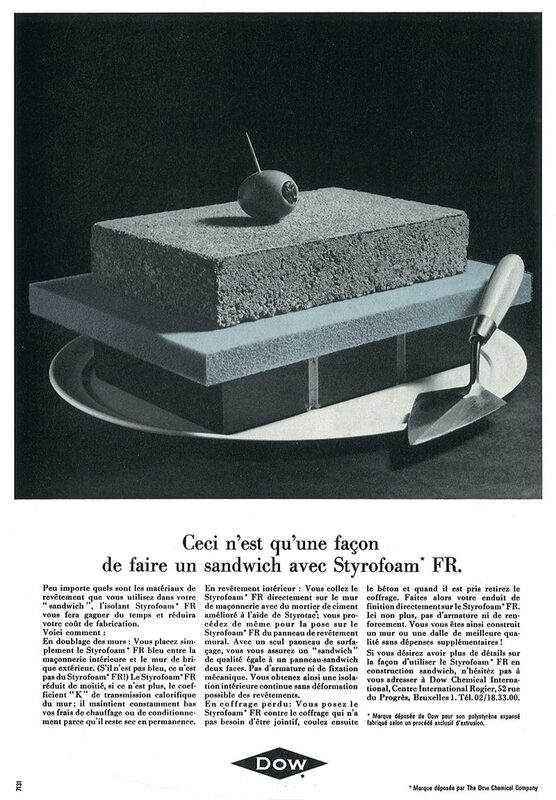 A visual aspect of Styrofoam by which you can recognize it, is the blue colour: as the slogan says, “S’il n’est pas bleu, ce n’est pas du Styrofoam FR!” Styrofoam could be used inside a cavity wall or as finishing on the inside or the outside of a single wall: Styrofoam did not need to be fixed mechanically but could simply be glued to masonry using cement mortar mixed with Styrotac. Or Styrofoam could serve as a permanent mould for in situ concrete (yet strengthened by a temporary structure or formwork during the casting process), after which it could be mortared or finished if desired. Used in the United States from the 1940s onwards, Styrofoam was introduced to the European market during the first half of the 1960s, when production of it started in the Dow factory in Terneuzen. Roofmate was made of the same material and according to the same production process as Styrofoam, so it possessed the exact same qualities. Roofmate was a blue, rigid plate, made especially for the insulation of flat roofs. Roofmate panels weighed only 40 kg/m³. As for their mechanical properties, they resisted uniformly distributed and concentrated loads, such as wheelbarrows, up to 0.20 N/mm² and more. There were many insulation companies active in the Belgian market, and they engaged in a wide variety of activities. A number of companies offered a complete service, from research and manufacture, to practical guidance in selecting products and installation. Two Belgian companies fall in this category: Isoverbel and the Etablissements Ernest Lenders. The latter specialized in acoustics, and it controlled the entire process, from production to construction. The company was at once a material producer and trader, building company, a research institute with laboratories, and a consultancy agency. As the market was so extensive, it was not uncommon for companies to focus on one specific material. The plc Quercine was such a company that focused on one particular product, namely cork. Founded in 1927 following the fusion of three Belgian companies with nearly 25 years of experience with cork, Quercine developed several insulation materials based on agglomerated cork, both for housing and industrial facilities. Their range of products for housing consisted mainly of relatively thin boards and sheets (Suberlino I, II and III, Liko, Aérom, and Expansiol), which were used in floors, walls, roofs, and ceilings. The company Foamglas specialized in cellular glass and it actually held a worldwide monopoly on it. The concept of cellular glass was developed by the glass company Saint-Gobain, which sold the patent to the American company Pittsburgh Corning Corporation in 1937. It was not until after the Second World War that the material was used in building applications, partially thanks to an intensive publicity campaign. Special accessories and glues were developed to apply the material in buildings. Foamglas was eventually introduced to the Belgian market: at first the material was imported to Belgium (one of the distributors in Belgium was Revisma), and in 1964, the first Belgian factory was established by Pittsburgh Corning of Belgium plc in Tessenderlo. Acoustical insulation is a term for a variety of products and materials that are applied to reduce sound level, to enhance sound, and to prevent the transmission of sound. 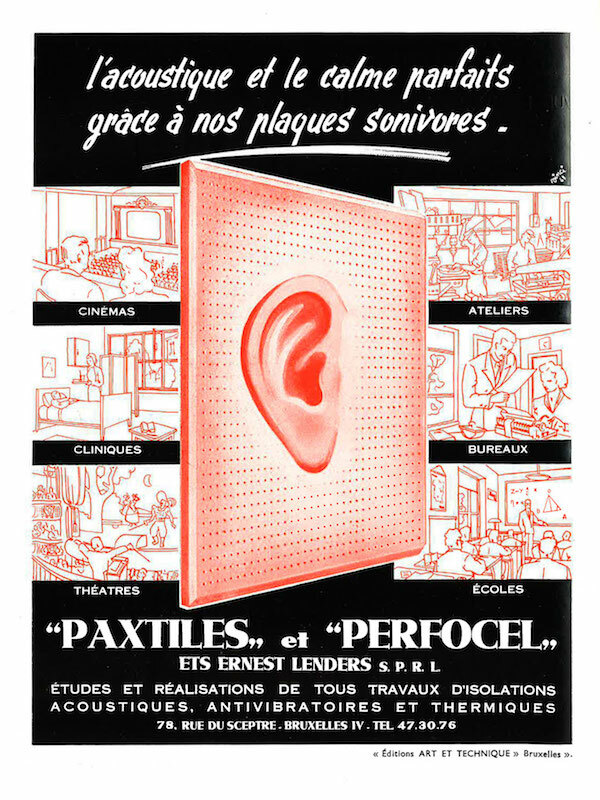 As the market for insulation products grew during the post-war period, a number of companies began to specialize in acoustical insulation products. However, in the early post-war period, the few existing insulation companies often produced both acoustical and thermal insulation. As these were niche products at the time and not fully understood by many architects and engineers, it was often opportune for a single company or consulting agency to handle them both. Also, a number of thermal and acoustical insulation products were manufactured with the same raw materials, mostly vegetal or mineral. In the early post-war period, attention in the architectural press to both heat and sound transfer increased, with even a small advantage for acoustical materials. This would change during the late 1950s and especially in the 1960s, when the demand for (better) thermal insulation increased, while advances in synthetic insulation materials emphasized the difference between the two concepts. One of the main Belgian firms focusing on acoustical insulation (with only a small part of their business related to thermal insulation) was Etablissements Ernest Lenders. Founded during the interwar period, Lenders focused on anti-vibration, insulation against air sounds (in floors, walls, screens, windows, and doors), acoustic corrections (in theatres and auditoria), and reducing reverberation. The company used many different raw materials, which they processed into a large variety of boards or panels. Lenders produced panels based on plaster (e.g. Gypstone), mineral wool (Wooltone and Wooltex), wood fibres (Reduxon, Perfocel, and Lenderson), and asbestos (Paxtile), as well as projected asbestos (S.L.A.). Another company specializing in acoustical insulation is Fourisol. Their products included Aciercoustic (perforated metallic plate), Aciercoustic Sound Lock (a sandwich panel for ceilings finished with an Aciercoustic panel), Ondulcoustic (a perforated and undulated steel or enameled plate), Alprocoustic (perforated steel plate), Profilacoustic (folded steel plate with an insulating core), Supersonisol (plate composed of vegetal fibres), Asbestos Spray, Acoustone (plate of mineral fibres), and Hansacoustic (plate with glass fibres). As the product range of Lenders and Fourisol shows, a recurrent theme in the acoustical insulation business was the large variety of panels. The panels were used for wall linings and especially for suspended ceilings. As they were often visible and could serve a decorative function, the companies strongly invested in the design of the panels, offering them in a large variety of colours, patterns, and finishes. The company Bruynzeel, for instance, developed the Antisone panel for walls and ceilings; composed of wood particles, the panels came in many forms and layouts and were finished with various veneers. A special feature of these panels was their grooved surfaces: these grooves connected to long, internal tubular cavities that captured sound waves. Other companies opted for perforated panels. 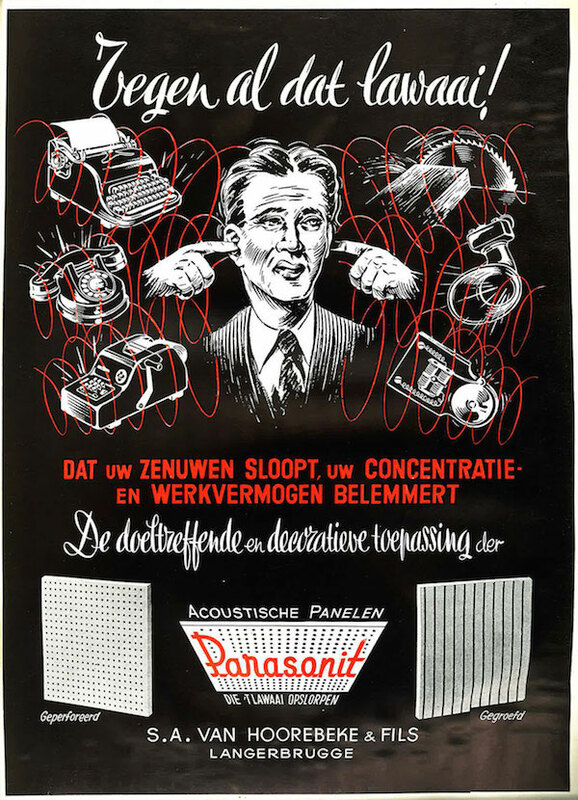 For instance, the company Van Hoorebeke & Fils produced Parasonit panels in three different varieties: one version had grooves, while the two others were perforated for maximum sound absorption. The Armstrong Cork Company also produced several types of panels and tiles for acoustical ceilings (Arrestone, Cushiontone, Travertone, Corkoustic), of which a number of them were perforated (Arrestone, Cushiontone, and Cushiontone F). The product range of Soundex included perforated plaster panels and acoustical ceiling panelling in perforated aluminium with an internal sound absorbing core. Like other kinds of wood fibreboard, acoustical insulation panels could be mounted in various ways (with glue, nails, or screws onto a flat surface, on a lattice structure, or a suspended ceiling structure). One of the few exceptions to the range of grooved and perforated panels and tiles for acoustical insulation was Acousticplast. This plaster, developed by Aeroplast, was applied by means of a trowel onto a plastered or cemented surface and walls in concrete, brick, or stone. It consisted of asbestos fibres, vermiculite, and an inorganic binding agent. This particular type of plaster was also thermally insulating (λ = 0.053 W/mK) and fire resistant (resistant to 1200° C); did not shrink; and was very light (2.5 kg for a 1 cm thin layer on one square meter). Looking into the people and organizations involved in the post-war insulation debate, several come to the fore. In 1952/1953 and 1956, La Maison published two series of articles on thermal and acoustical insulation by Antoine de Grave, an engineer and chief inspector at the Ministry of Public Works. It is remarkable that a high-ranking official was one of the first to write extensively on the topic in the 1950s – even more so because apart from the commercial advertisement campaigns and some isolated, short articles, it was not until the late 1950s that thermal insulation began to be regularly treated in the architectural press. In January 1958, Bouwen en Wonen published an article on the thermal insulation of houses as an important source of cost reductions. In March 1959, the magazine published a themed issue on heat and sound insulation, which included a compressed course of building physics. Also in 1959, Bouwen en Wonen reported several times on the exhibition on heat and sound insulation that it co-hosted with the National Building Centre in Antwerp. This traveling exposition was a German initiative: although many Belgian firms cooperated, Belgian industry, government, and professional associations apparently were not fully equipped to organize their own event at the time. Germany as well as the U.K. already had laws requiring the use of insulation in houses. In Belgium, France, and the Netherlands, such laws would not be issued until the 1970s. However, the exhibition can be considered a first step in an intensified, objective, and broad debate. Although the concept of U-value or thermal transmittance through a wall had been defined in the 1850s, it only became important much later. The λ-value of materials appeared in Belgian periodicals from 1959 onwards. The early 1960s saw the emergence of the ‘heating engineer’ and independent, specialized consulting agencies: they calculated U-values and compared different insulation materials and systems. Technical advice became increasingly indispensable in the flourishing insulation sector. Full thermal and heat balance studies took account of not only the insulating capacities of certain materials, but also the form and connection of different materials; inside and outside temperature; air currents; and ventilation systems. Insulation companies increasingly encouraged the development of knowledge and scientific debate. 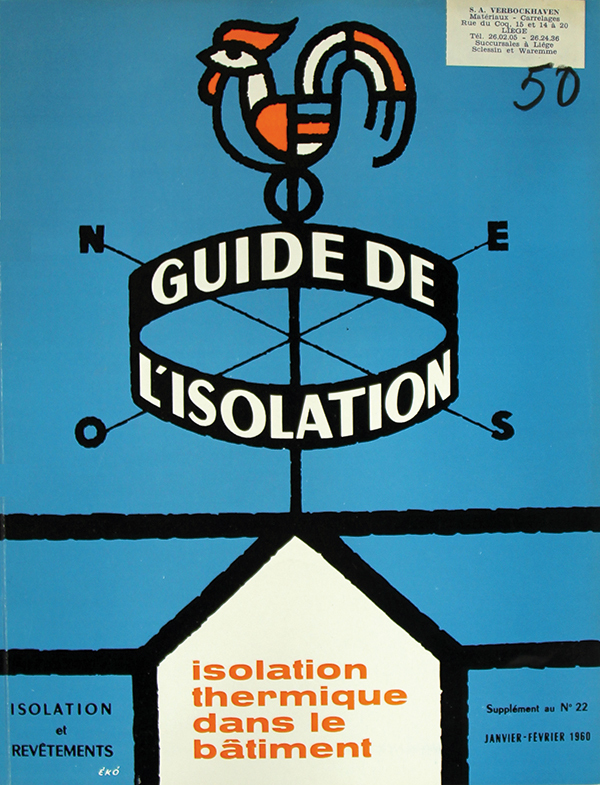 One of the first initiatives in this direction was the founding of the Association for Thermal and Acoustical Insulation in 1962 (about which La Maison reported between October 1961 and June 1962). This national association gathered companies, public authorities, and scientific institutions, such as the Belgian Building Research Institute (BBRI). Shortly before, the BBRI had created a technical committee on insulation, more evidence that the sector was professionalizing. The objectives of both the national association (to stimulate mutual knowledge exchange and to inform the public at large) and the BBRI (to do scientific research in order to improve the best practices) were in line with the recommendations of the international energy committee of the Organization for Economic Co-operation and Development of 1962, which urged governments and professional associations to disseminate information and issue minimal norms for thermal insulation. During the 1960s, the BBRI published several technical reports on insulation, for instance on the insulation of flat roofs (in 1962) and the measurement of thermal conductance (in 1964). The BBRI also strove to raise construction standards by means of its ‘General specifications for the execution of private buildings’, co-edited with the Royal Federation of Architects’ Associations in Belgium (FAB) and the National Confederation of the Building Industry (NCB). In 1973, 25 pages of the recommended technical specifications were devoted to thermal insulation, which covered basic concepts, properties, and guidelines for installing insulation. These prescriptions were not mandatory; rather, this was a reference work for architects and contractors in their daily practice. The first norm on thermal insulation in Belgium (NBN B62-001) was issued in 1974. Beginning work in 1969, a special committee of the Belgian Institute for Normalization (BIN) on Thermal Insulation of Buildings prepared the norm. It was presented in March 1974 at a national colloquium, co-organized by the National Institute for Housing (NIH), the insulation association (founded in 1962), and the BBRI, with support from several ministries. Antoine de Grave, then general director at the Ministry of Public Works, stated that the first Belgian norm was hardly innovative or trendsetting: indeed, when public authorities issued laws or regulations, they usually fell back on established technology, and synthetized research including some research, along with practices, that may have been outdated. The Belgium norm differed somewhat from those of other European countries, such as the first French regulation, also issued in 1974. Belgium proposed a maximum heat transmission index T for each room (which was set at 0.9 W/m²° C), while other countries, including France, proposed a maximum G-value or heat transmission for the entire building. The Belgian T-index was coupled with prescriptions regarding condensation and minimum thermal resistance of certain walls. 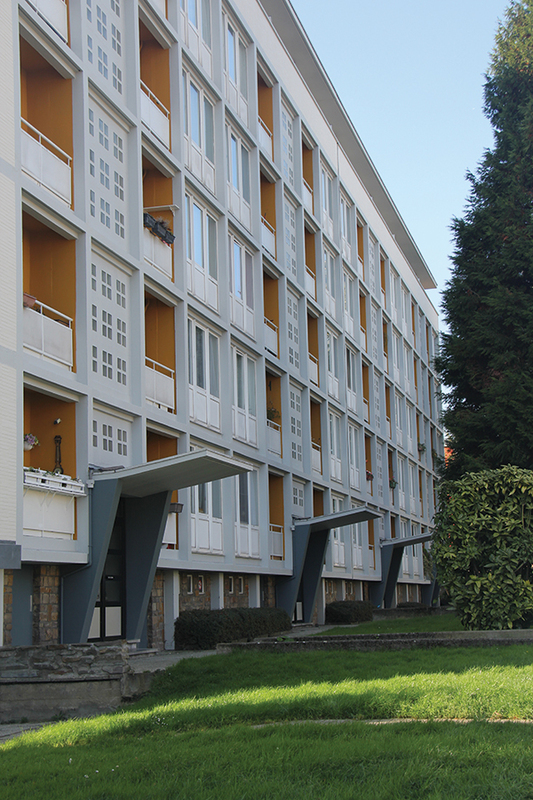 In all, this norm reflected “a rational, global method to improve the thermal insulation of buildings and to reduce energy consumption without decreasing the comfort of the inhabitants” (de Grave 1974). The twofold objectives of energy/economy and comfort were not new, but in fact seem to have guided practice and product development in the previous three decades. Economy and comfort were keywords in the discourse on thermal insulation at an early date. Insulation companies especially focused on cost-saving aspects when marketing products to architects and homeowners. Isoverbel, for example, used the slogan “Isoler, c’est épargner”. 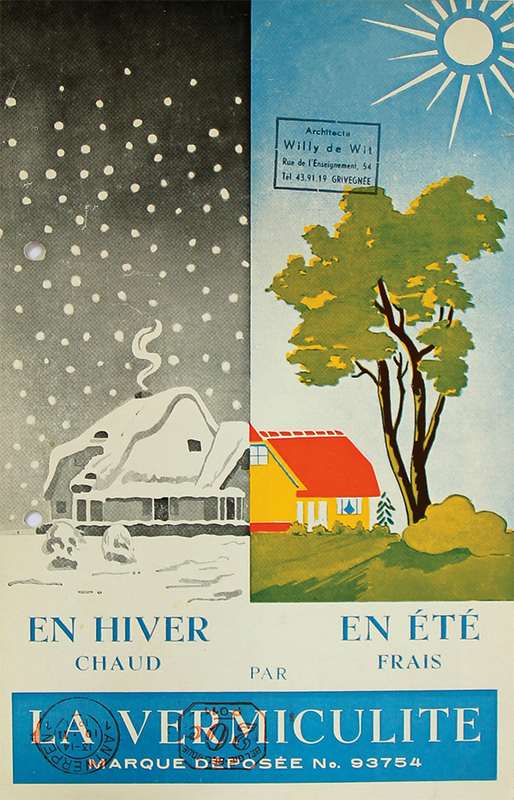 In January 1958, Bouwen en Wonen deplored the fact that many houses were built without insulation. The journal calculated that as much as half of a building’s heat was being lost due to insufficient insulation and that the loss could be reduced to 15% by including 10 cm of mineral wool in the walls and roof. On the other hand, the cost of insulation installed by specialized firms would amount to 10% of the total cost of the house. Illustrative of the economic argument is the book Thermal design of buildings (Rogers 1964) and its revealing subtitle: a guide to economically sound thermal design. The book was meant as an easy-to-use guide to translate building performance into costs, because “dollars are easier to understand than Btu’s” [Btu = British Thermal Unit]. Rogers also pointed out that the increased use of glass should be taken into account: the average amount of glass in a building’s enclosure had doubled from 15% of the surface area two generations ago to 30% in the mid-1960s. Indeed, post-war architectural trends towards more open, lighter, and less inert structures (e.g. curtain walls) made adequate thermal design even more important. During the 1960s, energy use increased because of a general economic expansion, growth in the building stock, and higher comfort demands. This upward trend stalled in the early 1970s, when energy prices rose due to a global oil trading conflict. Around this time, in 1972, the Club of Rome’s Limits to Growth raised public awareness of the finite supply of natural resources, in particular oil. It made people more conscious of heat loss and resource depletion. The oil crisis created an insulation shortage in the U.S., while the production of thermal insulation in France and Germany (the two largest insulation markets in Europe) doubled between 1979 and 1980 to meet increasing demand. The story of thermal insulation in the post-war period goes beyond the pure primary insulation materials mentioned above. From the 1950s onwards, the insulating properties of building materials in general were developed and highlighted in product marketing. The three main types of secondary insulation materials pertinent to this story are decorative panels, glass, and concrete. The insulation value of decorative panels was upgraded by adding an internal layer of insulation material, which transformed them into sandwich panels. Glass was incorporated in the insulation discourse by means of double glazing, produced in Belgium since 1947, and other types of glass with special properties, such as athermanous glass or semi-reflecting glass. For concrete, the problem of heat transfer was partially overcome with lightweight concrete, popular from the 1950s onwards throughout Europe. The importance of primary and secondary insulation materials in post-war construction can be assessed using examples of newly erected houses in Brussels published in the architectural press between 1945 and 1970. Of the approximately 160 examples for which construction materials were described, over 40% of them mention insulation materials. With respect to primary or secondary insulation, in 12%, primary insulation was applied (e.g. glass fibre panels and blankets, wood fibre-cement panels, rock wool, expanded polystyrene, and cork). Another 20% used secondary insulation (e.g. lightweight concrete Ytong and Durisol; double glazing Thermopane and Polyverbel; insulating glass Thermolux; and prefabricated boards and sandwich plates Glasal, Linex). About 12% of the houses incorporated both primary and secondary insulation. 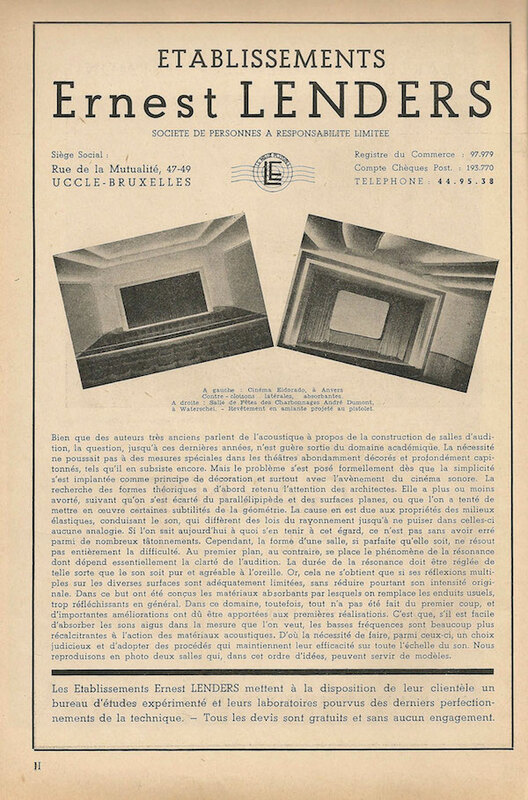 The first example of insulation materials in a residential building in Brussels published in La Maison was one in which primary and secondary insulation materials were used: a freestanding villa in Uccle, published in November 1948, and designed by architect Simone Guillissen-Hoa. She used glass silk mattresses in the roof and roof terrace, Durisol lightweight concrete floors, and Celotex panels (based on cane fibres) for the ceiling. Among the examples of primary insulation materials, vegetal products were the most common, with mineral products a close second, while synthetic products were rare. This is partially explained by the limitations of the sample, because synthetic insulation materials only became available and known during the 1960s. In the category of vegetal insulation, wood seemed to be a favorite product. Other vegetal products used were cork and occasionally also reed. Among the mineral products, glass was by far the most popular, mostly in the form glass wool or sometimes as glass fibre panels. Two other mineral products mentioned were rock wool, which was also relatively popular, and expanded mica. Considering the architectural press did not discuss (all) materials in many cases, it is probable that the use of insulation materials was higher, demonstrating the increasing presence of thermal insulation in building practice even before the oil crisis in 1973. Go to the image archive or Read "glass and glazing"